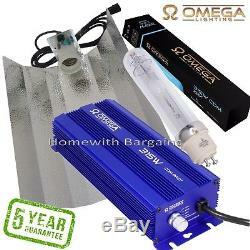 315w CDM Digital Omega Ballast FULL DAYLIGHT SPECTRUM (3000k) Grow Light Kit. 315w CDM Full Daylight (3000k) Grow/Flower light. 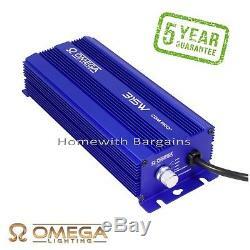 OUTPERFORMS ANY 600w HPS SYSTEM! 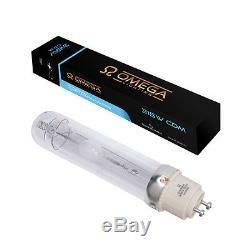 Omega Lighting 315w CDM Ceramic-Discharge Metal Halide grow light kit delivers a light spectrum that's much closer to natural sunlight than typical high intensity discharge (HID) systems. These state-of-the art lamps generate a greater level of useable plant light (photosynthetically active radiation) and run with a blinding intensity that's immediately apparent to the naked eye. The lamp is optimised for the bloom phase with enhanced reds, but, because it's full-spectrum, it will produce the goods in both veg and flower &###x2013; expect to see increased growth rates, tighter internodes, an improvement in overall vigour and an increase in final weight. Come harvest time, you'll be left wondering what you did without one. CDM fixtures utilise ceramic-discharge metal halide lamp to produce a light spectrum that's much broader than other forms of HID lighting (like standard&###xA0;&###xA0; metal halides and HPS). Its output is more comparable to the light produced by LEP (light emitting plasma) units. LEPs actually have a slightly broader spectrum than the CDM fixture, but they simply do not compare in terms of brightness. You can see with your own eyes, as soon as you turn this unit on, that it is brighter than any MH or HPS grow light you will have used before. This light provides the best or both worlds, a unit that delivers an LEP-style spectrum combined with HPS-style intensity. A blinding intensity that's clearly visable with the naked eye. Ideal as both supplementary and standalone lighting. Highly efficient - puts out 1.9 micromole (umol) per watt of electricity. Euro Barn Reflector with CDM adaptor. Omega Lighting are never afraid to sample new technologies. We love good quality LED lighting because of their low power consumption, low heat output and they produce a very high quality end product. HPS are a tried & tested&###xA0; formula that is guaranteed to produce good sized fruit & flowers time and again. These new CDM light fixtures are a superb compromise as they produce&###xA0; plants of the very highest quality and of a size that any HPS grower would be proud of. &###xA0; Our success has been achieved though purchasing at highly competitive prices and passing the savings directly on to the customer. Our aim is to provide customers with something many of our competitors fail to achieve: competitive pricing coupled with 5 Star customer service. &###xA0; Items weighing over 2kgs will be sent by Courier. Closed Sunday Homewith Bargains Ltd Unit 11 Chillingham Ind Est Back Chapman Street. Byker Newcastle upon Tyne NE6 2XX Tel: 0191 276 4333. This listing is currently undergoing maintenance, we apologise for any inconvenience caused. The item "315w CDM Digital Omega Ballast FULL DAYLIGHT SPECTRUM (3000k) Grow Light Kit" is in sale since Sunday, April 24, 2016. This item is in the category "Garden & Patio\Hydroponics & Seed Starting\Grow Light Kits". The seller is "homewith2004" and is located in Newcastle. This item can be shipped to United Kingdom.